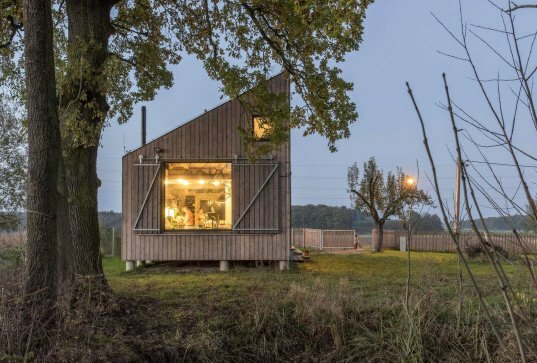 Inspired by a four year-old boy and a beautiful old oak tree, this incredible house in Eastern Bohemia, surrounded by fields and forests, is one family's perfect year-round escape from the inquietude of the modern city. Imagine coming home to this everyday: a wood-built open-plan home in tune with nature where panoramic-effect windows amplify the space and a unique design brings the best out of the sun and the seasons. In tune with nature, the house, created by ASGK Design features a southern-sloping roof with overhang oak branches, making you feel like you are in the tree itself. Just the way the little boy imagined it. This house is so full of life it even has a name: Zilvar. Zilvar is a work by ASGK Design in the Czech Republic built for a family who wanted more than the common urban existence. Set within a microclimate of frequent rain, strong western winds and eastern sun, the house is designed around natural cycles and allows you see and experience the natural elements. The southern end of the house is crowned by the sweeping oak tree and the northern sloped roof has a large window facing the opposite direction from which the countryside stretches out into the distance. The inspiration for the design came from the four year-old son of the owner who was fascinated by anthropodic shapes and the big old oak tree that he imagined as part of his house. “The open-plan house consists of a lounge, kitchen and dining area downstairs, which open out to the bedroom galleries at opposite ends of the house upstairs, by industrial-shaped staircases either end, providing communication between all sections of the house,” explained ASGK on their website. A glass sliding door opens out on to the eastern terrace creating the optical illusion of more space, further enhanced by the continuity of the same flooring used throughout the stand-alone structure. There is a year-round outdoor dry-space that is protected from the rain at the northern entrance and the house is graduated on the east side, providing another dry outdoor area. Zilvar is very low energy due to a “diffusion-open wall assembly”, which is a great way to insulate timber homes, keeping heat in moisture out. What happens is that the system allows some of the moisture into the structure and on into the exterior, part is absorbed and retained by the wood, and after the moisture in the interior is reduced, it is released back into the atmosphere. This eliminates the need for a plastic vapor barrier, and the problems associated with it. 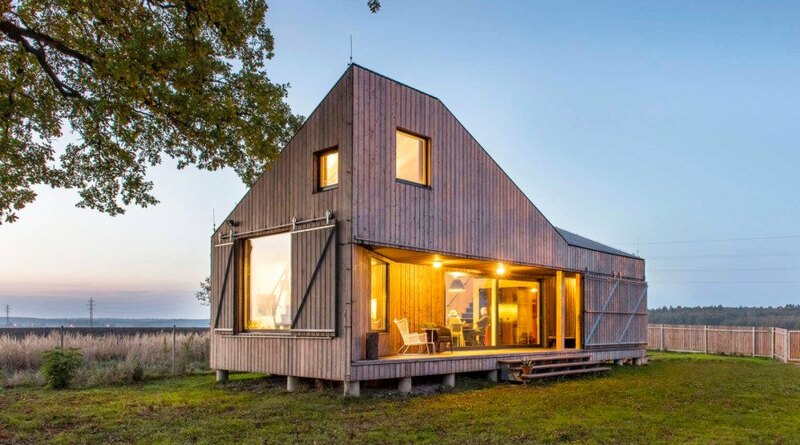 The façade, roof and interior are made with larch timber – a strong and durable wood – and a “burn and stain” technique on the exterior wood-cladding means longer-lasting life. The huge glazed window in the main living space is great for solar gain in the winter and large sliding wooden shutters protect the family from the summer sun. The angular shape of the home seems to shift with the play of light and shadow during the day and the emphatic spaces with natural views give you a sense of being inside a true architectural adventure. Zilvar is a work by ASGK Design in the Czech Republic built for a family who wanted more than the common urban existence. Set within a microclimate of frequent rain, strong western winds and eastern sun, the house is designed around natural cycles and allows you see and experience the natural elements. 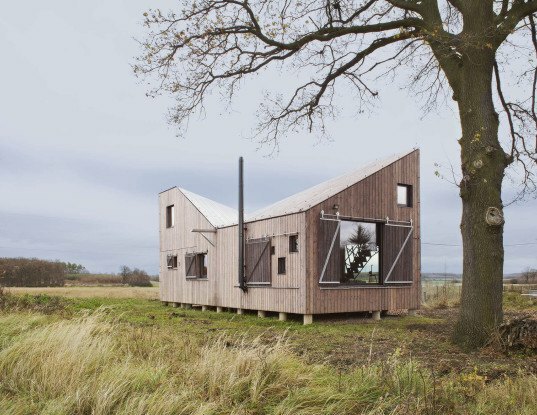 The southern end of the house is crowned by the sweeping oak tree and the northern sloped roof has a large window facing the opposite direction from which the countryside stretches out into the distance. “The open-plan house consists of a lounge, kitchen and dining area downstairs, which open out to the bedroom galleries at opposite ends of the house upstairs, by industrial-shaped staircases either end, providing communication between all sections of the house”, explained ASGK on their website. There is a year-round outdoor dry-space that is protected from the rain at the northern entrance and the house is graduated on the east side, providing another dry outdoor area. Zilvar is very low energy due to a “diffusion-open wall assembly”, which is a great way to insulate timber homes, keeping heat in moisture out. What happens is that the system allows some of the moisture into the structure and on into the exterior, part is absorbed and retained by the wood, and after the moisture in the interior is reduced, it is released back into the atmosphere. This eliminates the need for a plastic vapor barrier, and the problems associated with it. The huge glazed window in the main living space is great for solar gain in the winter and large sliding wooden shutters protect the family from the summer sun. 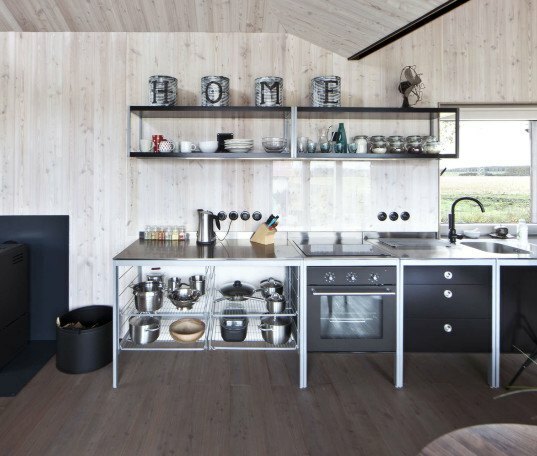 The façade, roof and interior are made with larch timber - a strong and durable wood - and a “burn and stain” technique on the exterior wood-cladding means longer-lasting life. A glass sliding door opens out on to the eastern terrace creating the optical illusion of more space, further enhanced by the continuity of the same flooring used throughout the stand-alone structure.